Baked steak tips are delicious and easy with a simple barbecue flavored marinade. Pairs very well with a Tannat red wine from Uruguay. Note prep time include one hour to marinate the beef; there’s only 10 minutes active prep time. Make the marinade: in a small bowl, combine all of the ingredients from the through the black pepper. Pat dry the steak tips. Place the steak a large sealable plastic bag. Pour the marinade, then seal the bag. Gently toss the the steak in the marinade so that the steak is all well-coated. Marinate in the refrigerator for at least one to two hours prior to cooking. Preheat the oven to 400 degrees when you are ready to start cooking. At the time you begin preheating the oven, move the steak tips to the counter to start bringing to room temperature. Coat a large, oven-proof skillet with the oil spray. Heat the skillet to medium high on the stove top. Add the steak tips to the skillet, and brown on one side for 1 to 2 minutes, then turn this tips over to brown on the other side for another minute. Move the skillet to the oven and bake for 10 minutes. After 10 minutes, check steak for doneness. Smaller pieces may be done at this point, larger pieces may need a few more minutes. Remove any pieces that are done to a platter, and tent with aluminum foil to keep warm. Return the skillet to the oven to finish any steak tips that need a bit more cooking. They should be done to medium rare in 3 to 5 more minutes, or 14 minutes total cooking time. Add a couple minutes to cook to medium. Remove the skillet from the oven. Transfer the remaining steak tips to the platter, and pour over any juice that has built up in the pan. Let the steak rest for a few minutes. Slice into serving portions, plate and enjoy! 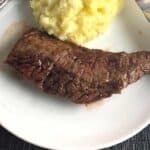 You will likely have several pieces of steak tips if you are making the amount given here in this recipe. They tend to come in a variety of sizes, thus you are likely to need to cook some pieces longer than others. Alternatively, if some people prefer their meat medium to medium well, cook all of the steak for the same amount of time and give the small pieces that like their steak cooked more. Note prep time include one hour to marinate the beef; there’s only 10 minutes active prep time.